Ah... Summer seems to finally have arrived in Seattle. Maybe that's why the last few shades I have done have all been out of fresh, hip, prints on linen. The summer breeze drying your sheets on the line...summer dresses in yellow and pink stripped linen or red and blue piped linen skirts at a picnic. What are these two lamps wearing this fine summer's day? 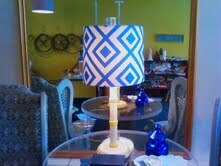 First: Leah's shade is a white linen printed with a David Hick's blue geometric zig-zag and square pattern. 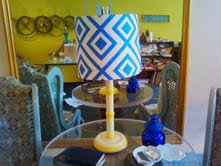 Bold and striking on this sweet yellow and white vintage bamboo base for her daughter's room. Second: Christina's adorable antique brass and cut glass lamp features a lamb and a babe at it's base and she wanted to contrast the old base with a contemporary shade. She chose a natural linen printed with a charcoal gray "Sea Urchin" by Kelly Werstler. Doesn't get more summery than sea life. 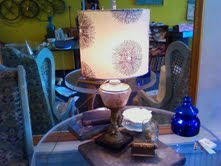 Hope you enjoy the weather and if your lamp needs a summer wardrobe, I'm out back of the shop makin' shades in the sun. Piper's lamp looks sooooo good! Fabulous job, as always! Together we can conquer the world, I just know it.